“A few years ago, when the city was deciding whether to go forward with San Diego’s new Central Library, there was discussion around town about the future of public libraries. Did we need to replace the 1954 Central Library? (Most said yes.) 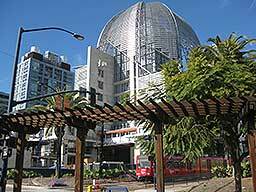 Was San Diego Public Library focused on downtown at the expense of neighborhoods? (Half of the 35 neighborhood libraries have been built, rebuilt or expanded since 1989, with more projects planned.) Did a grand new structure make sense with a digital shift under way? Do libraries have a future? What does that look like? Let me get one thing out of the way. People don’t generally associate libraries with high-tech innovation. I get asked regularly about our quaint old card catalogs only to explain that they were digitized decades ago. San Diego Public Library’s catalog went digital in 1984 with remote access via Telnet and dial-up added in 1994. Internet access began in the city’s branches that same year, using the then-current browser, Netscape 1.0. In 2001, our libraries started circulating eBooks online. Three years later, free WiFi arrived in all of the city’s locations. All this is just to say that technology per se is familiar and unintimidating to libraries. But more fundamental things are changing. Books and information used to be scarce. Public libraries, by facilitating sharing within their communities, were a solution to that problem. We still do that for all sorts of materials, building access to current technology. Though that service is changing – more so for encyclopedias, less so for picture books – it still has value, especially to those who have the least. Now it’s attention that is chronically, critically scarce, and it’s the facilitated sharing of expertise, assistance, curation, community rooms, workspaces, storytimes, early learning spaces and the like that has rocketed in value. Attention-sustaining goods are not new to libraries and the shift in emphasis is one that libraries have been responding to for a long time. That’s reflected in the new Central Library and throughout San Diego’s public libraries. The future of libraries includes some unchanged, but often overlooked things. Public libraries offer community membership for free. Live in the city? Get a library card. Just arrived from across the globe? Get a library card. And that community membership is expanding. Partnerships increasingly allow library card holders to borrow passes to local institutions like the New Children’s Museum and the San Diego Museum of Art. The library of the future is a community hub that extends beyond the library itself. There are challenges. Digital Rights Management (DRM), the code in most commercial digital content, controls who can and cannot use that content on which device, when they can access it and what they can do with it. DRM-ed eBooks and other content are licensed for use, not purchased. This is a major hurdle for libraries and it’s sometimes remarked that if libraries didn’t exist, it’d be impossible to create them now. How libraries, publishers, consumers and the law respond to DRM will shape libraries in ways yet unknown. There are more mundane challenges. We’d like to be open longer. We’d like our online and logistics systems to be more nimble and advanced. We’d like to experiment more, which also means failing more. To move beyond those challenges we need the public’s support and input, met by libraries that are responsive and engaged with their communities. Jeffrey Davis manages a San Diego Public Library neighborhood branch.